Move over, flash mobs. Mass Mobs are here. Inspired by flash mobs, groups of Catholics have started Mass Mobs, an effort to gather the faithful to a specific church via social networking to attend Mass together. “This group is bringing back the community,” says the Rev. Ravi Marneni of St. Francis D’Assisi. Mass Mobs have popped up in several cities, such as Philadelphia, Pittsburgh, Cleveland and Buffalo. The Detroit Mass Mob recently attended mass at St. Florian in Hamtramck, Mich. The Rev. Mirosaw Frankowski, St. Florian’s priest, told The Daily Signal the Mass Mob had a positive impact on his parish. Frankowski said that St. Florian’s typically has about 1,000 parishioners attend its weekend services, but the Mass Mob brought more than that to a single Mass. After the Mass Mob attended St. Florian, Frankowski said there seemed to be a few more people at Mass, and that their weekly collection “is better than it was before,” a blessing for a church that is renovating. Because, I mean, such a big crowd, it’s impossible to see these days in any of the churches. But thanks to the mob Mass, we have this feeling of what it was so many years ago, when the churches were filled with people. 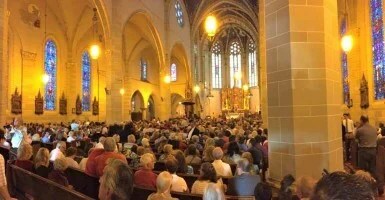 Last Sunday, the Detroit Mass Mob attended the 125th anniversary Mass at St. Francis D’Assisi Church in Detroit. Marneni estimates that 1,600 people attended the Mass, many of whom were first-time visitors to his parish. “The Mass, the celebration, really touched many of them,” said Marneni. Marneni says that faith groups such as the Mass Mob are having a positive influence on the community. The Detroit Mass Mob’s next event is the noon Mass on Nov. 16 at Our Lady Queen of Apostles Church in Hamtramck, Mich.